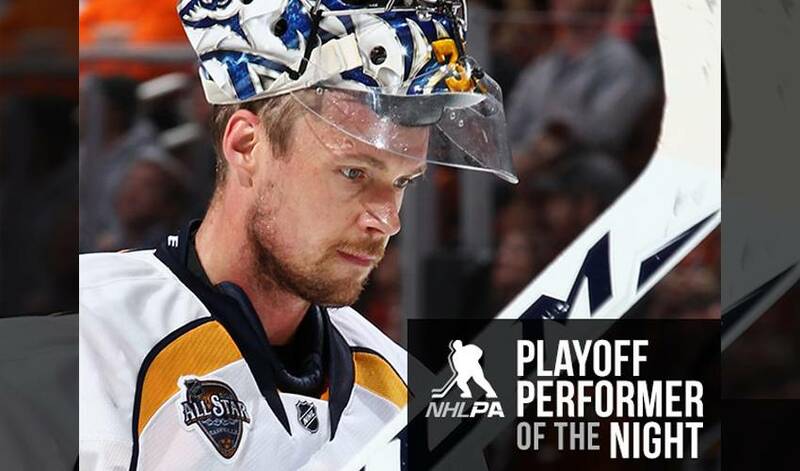 Nashville netminder Pekka Rinne snags PPOTN honours for his big-time performance in Wednesday night’s 2-1 win over Anaheim in Game 7. The Finnish veteran was a force throughout the deciding contest, playing a big part in sending the Predators into the Western Conference second round where they’ll face San Jose. STAT PACK: Rinne stopped 36 of 37 shots, allowing only a power-play marker in the third. He faced 28 shots over the final two frames, and finished the game with a .973 save percentage en route to First Star status. DUCK DYNASTY? : Rinne, who also helped the Predators eliminate Anaheim in the 2011 Conference Quarterfinals, improved to 8-5 in 13 all-time playoff meetings against the club. He owns a 12-5-4 record in 21 career regular-season contests vs. Anaheim (2.29 GAA, .919 save percentage, 2 shutouts). ON A MISSION: Rinne had his No. 35 jersey taken aboard the Space Shuttle Discovery on Mission STS-133 on Feb. 24, 2011 as a personal item of Col. Tim Kopra. HELPING HAND: The 33-year-old works with Best Buddies of Tennessee, who creates opportunities and friendships for people with intellectual and developmental disabilities. A NOVEL ACE: Rinne’s hobbies include reading and tennis. FINNISH-ING TOUCHES: His most memorable hockey moments include winning a pair of Finnish League titles (2004-05) and playing in the Calder Cup Finals (2006). ONE (AND PLENTY MORE) FOR THE RECORD BOOKS: Rinne holds several Nashville team records, including career regular season wins (238), shutouts (40), games played (447), and minutes played (25,853). PERSONAL FAVES: Rinne’s list of favourites includes Rambo (movie hero), Neil Young and the Red Hot Chili Peppers (musicians). SHARED DAY: Rinne has the same birthday (November 3) as model Kendall Jenner and NFL quarterback Colin Kaepernick. HONOURABLE MENTIONS: Shane Prince had two goals, John Tavares recorded one tally and one helper, and Brock Nelson chipped in with two assists, as the New York Islanders defeated Tampa Bay 5-3 in Game 1 of their Eastern Conference semifinal.